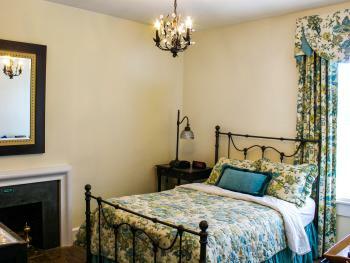 The most popular room on the estate. 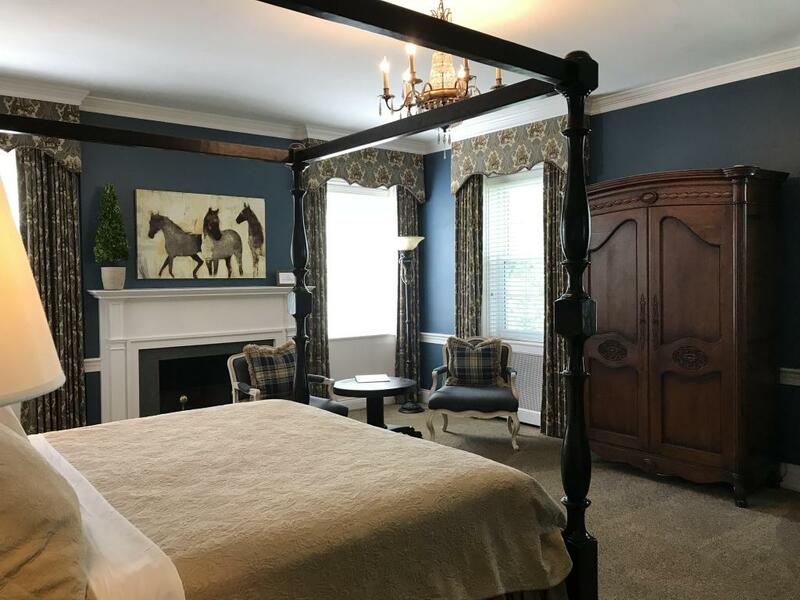 This rich master suite is one the ground floor and includes a king-size bed and is designed to reflect the equestrian history of the property. 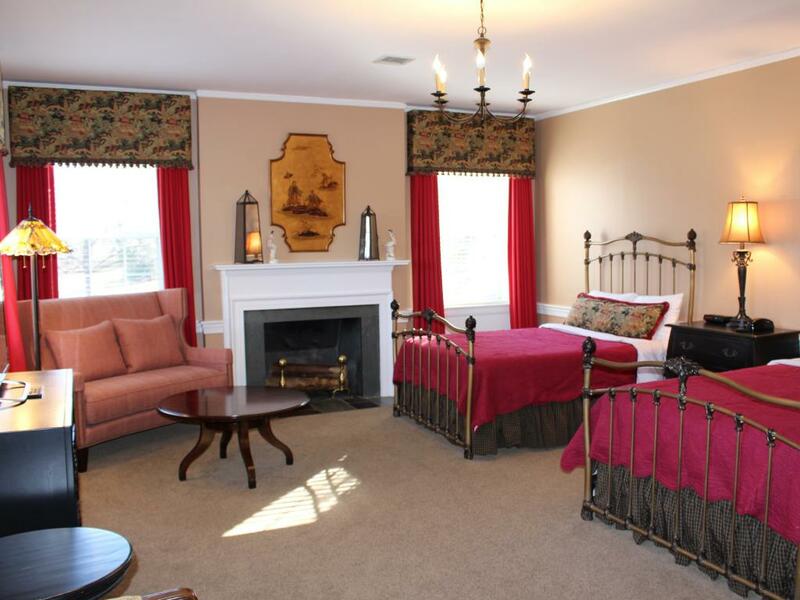 This corner room with four windows provides a view of the expansive front lawn and distant pastures. 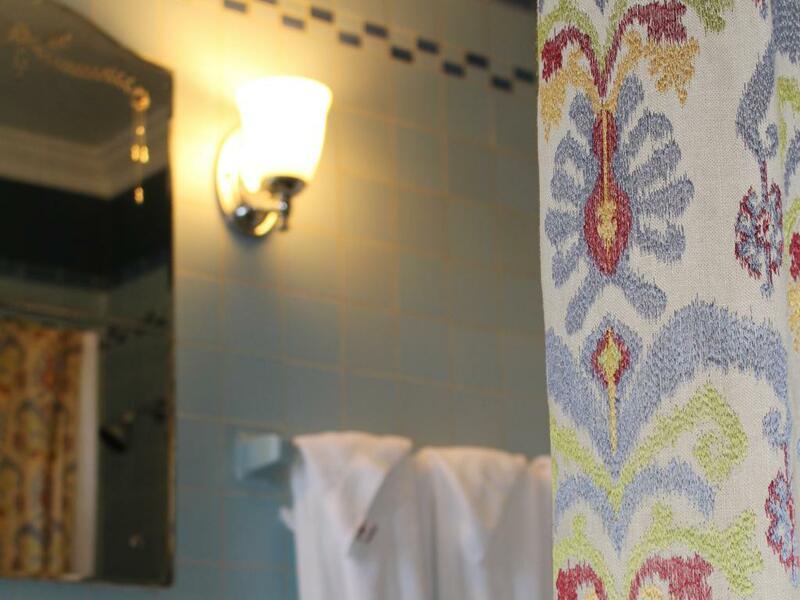 The Johnson Room features a full private tiled bath including a tub/shower and period fixtures. 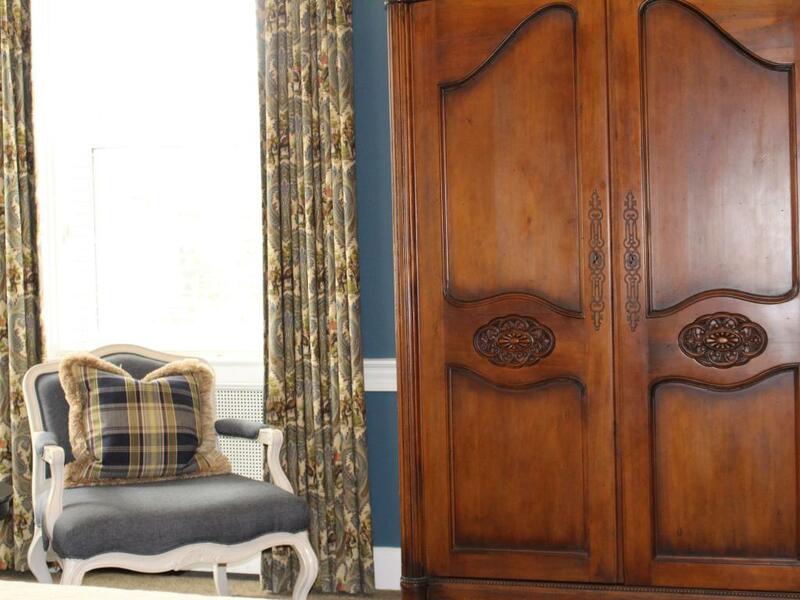 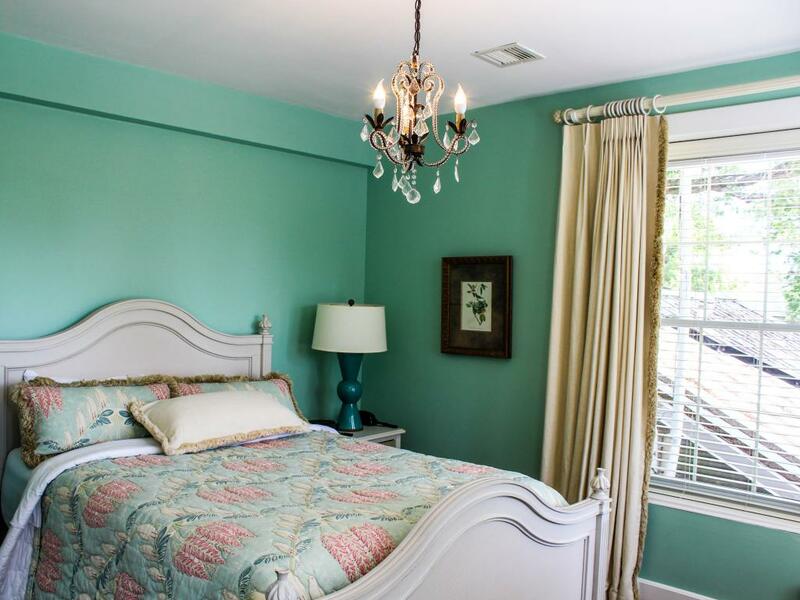 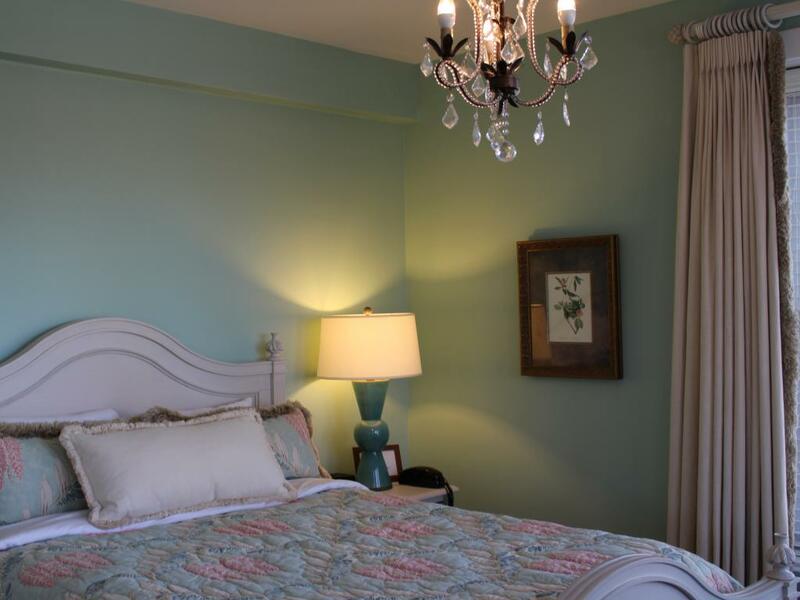 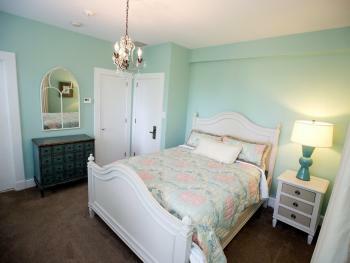 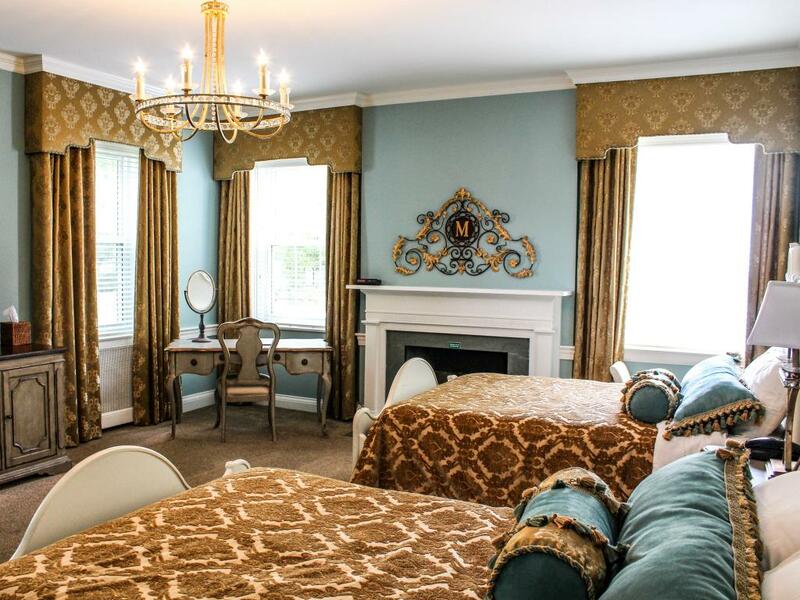 This well appointed room contains antique reproductions of the Reynolds home, including a queen bed and chandelier. 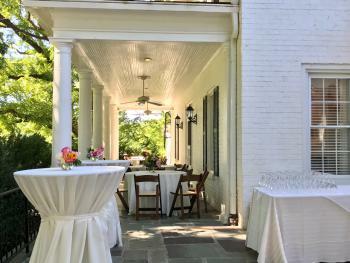 The view is of the Trophy Room veranda, front lawn and distant pastures. 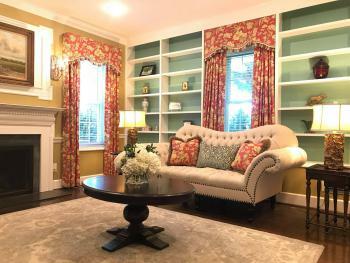 It features a sitting area with two chairs and small dining table. 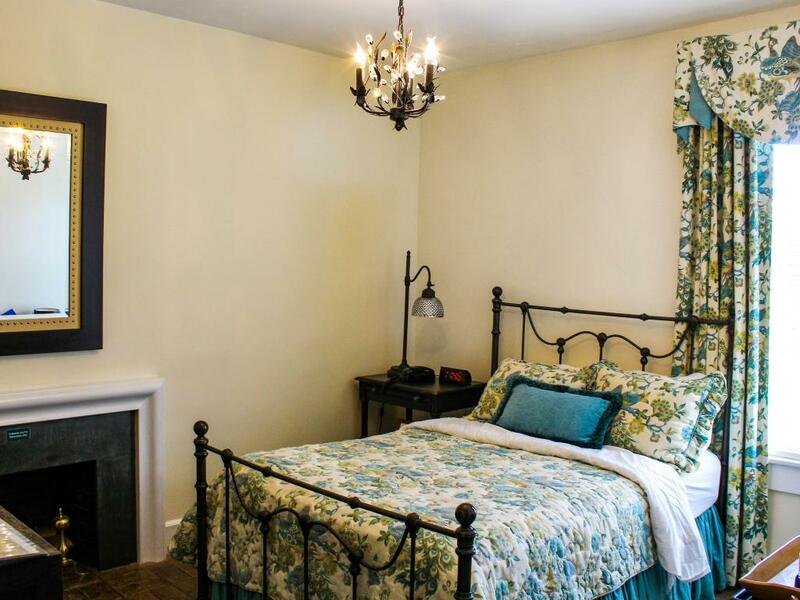 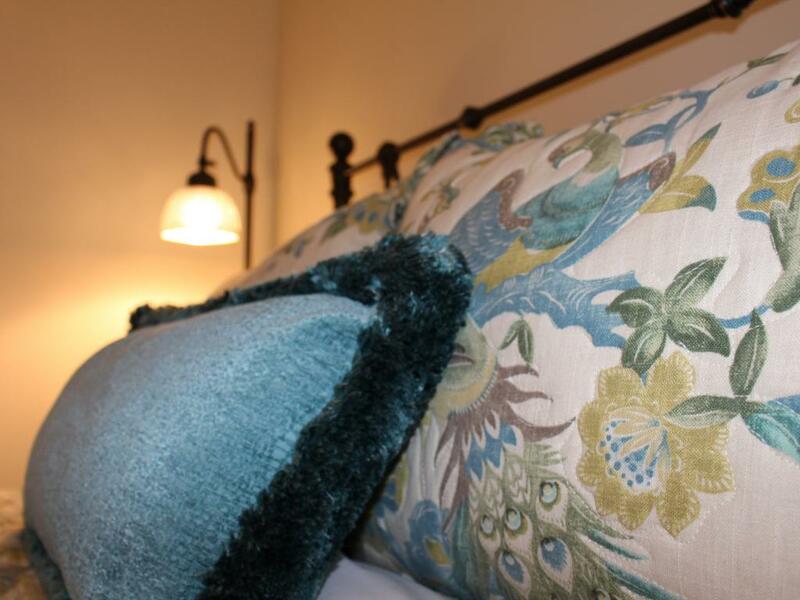 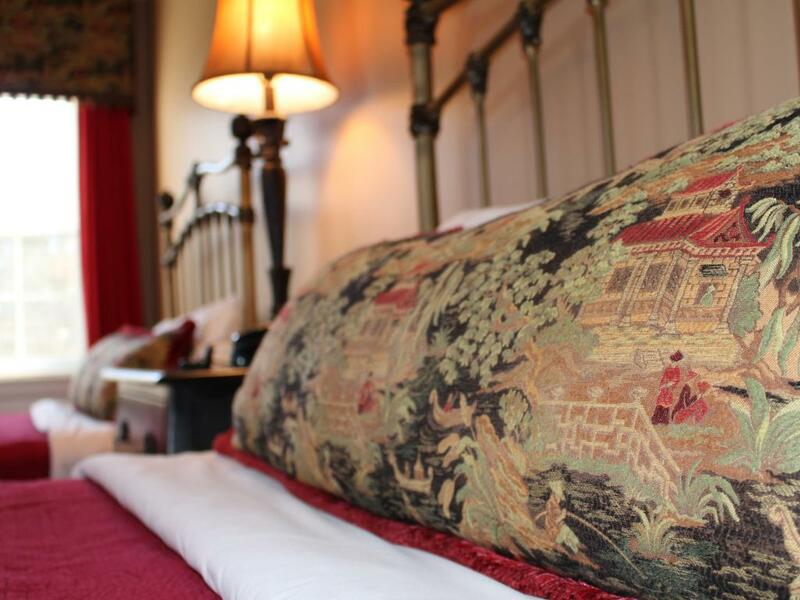 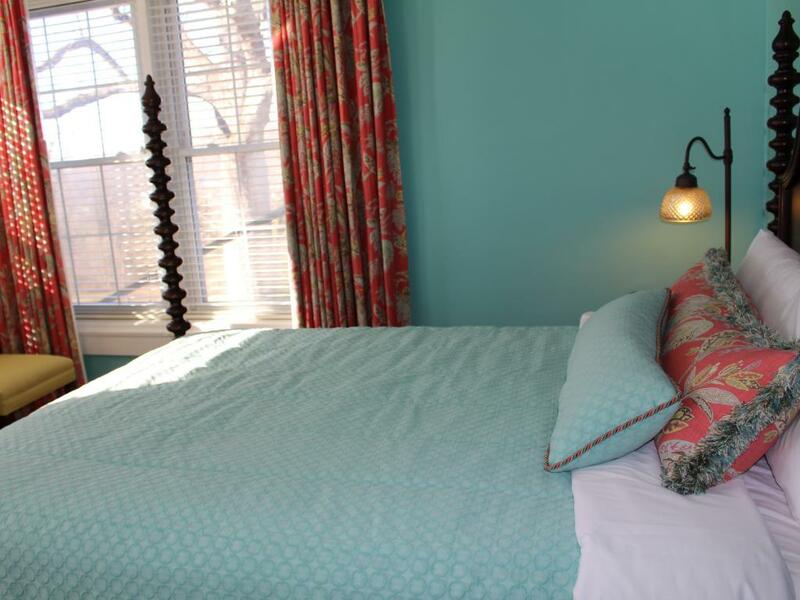 Located in the rear of the house, this cozy corner room includes a single double bed. 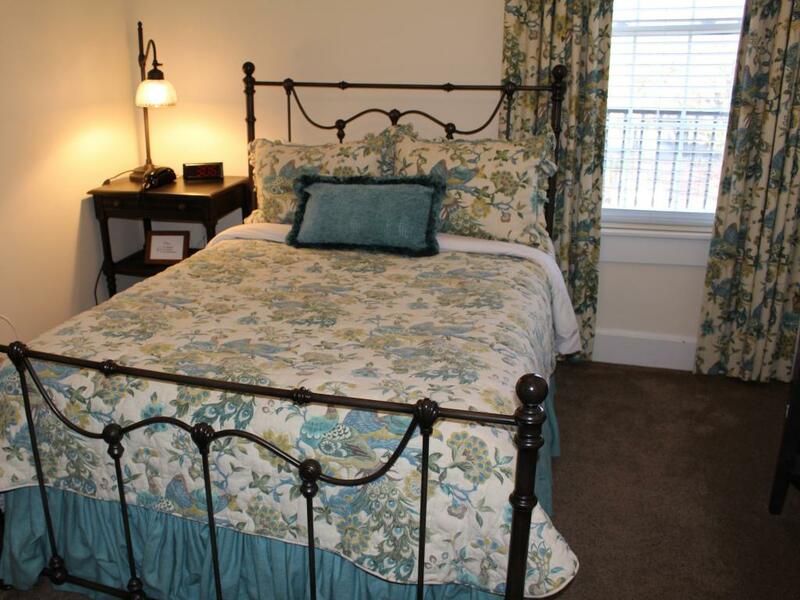 This room overlooks black walnut trees which lead to the Arboretum, and has a full tiled bath. 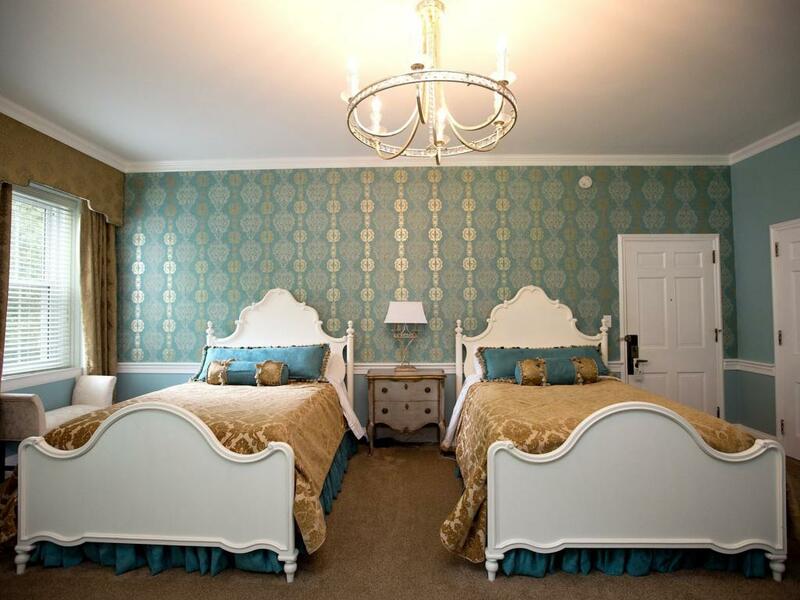 This room, dating back to the 1930's, reflects Kate Reynold's love of the Victorian era with its delicate period wallpaper and window treatments in light blue and white. 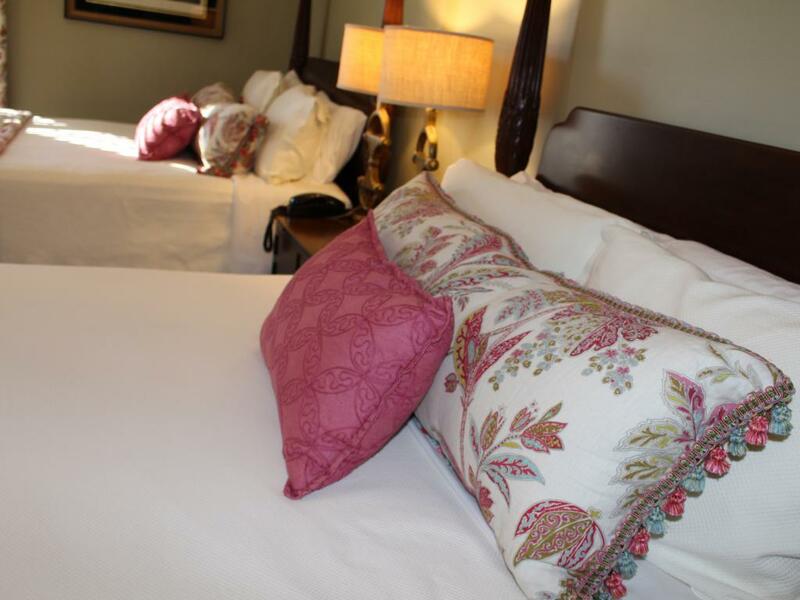 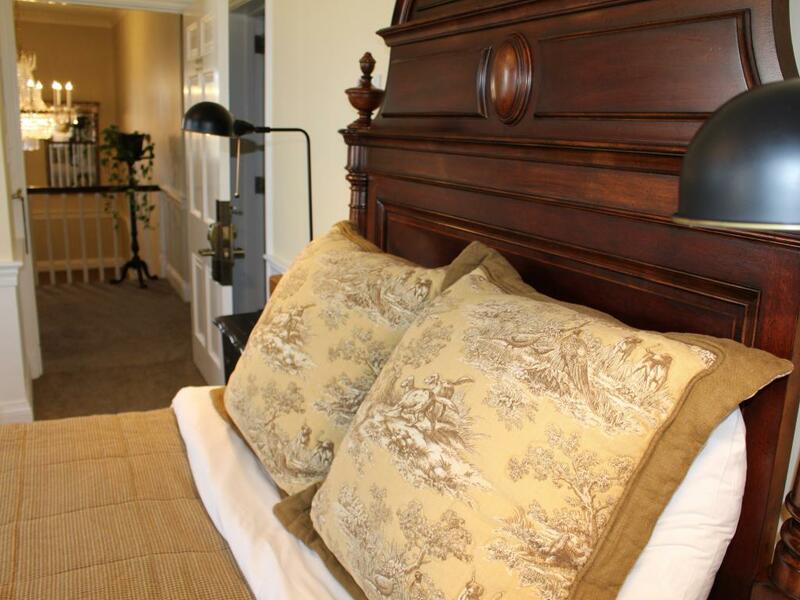 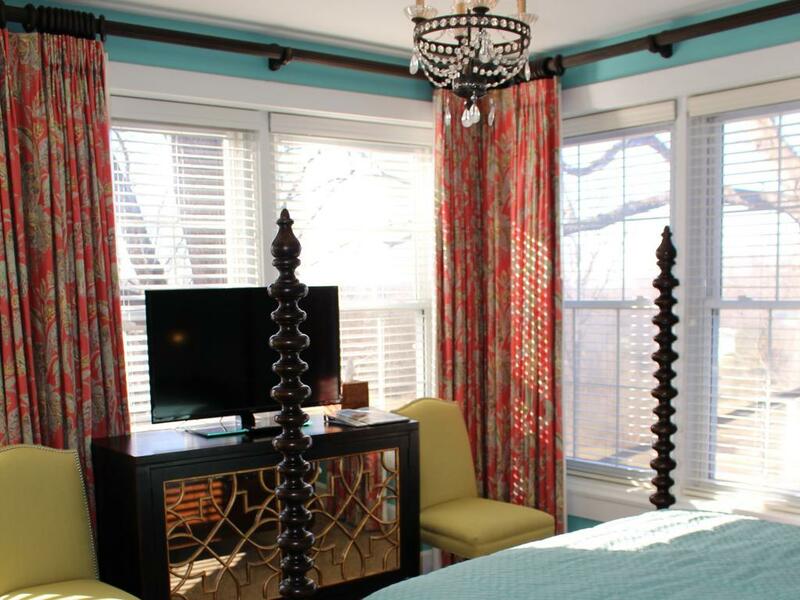 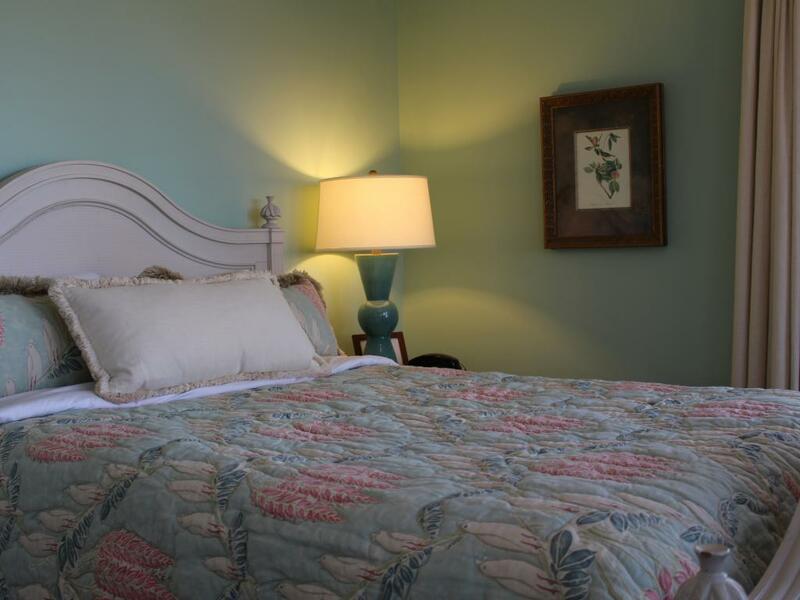 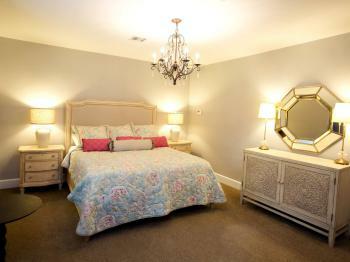 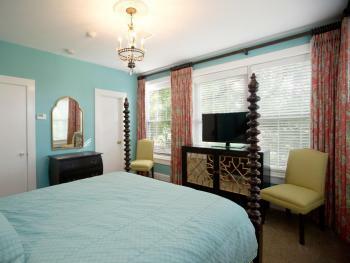 This corner guest room features two double beds and four windows which overlook the Arboretum and distant Guest House. 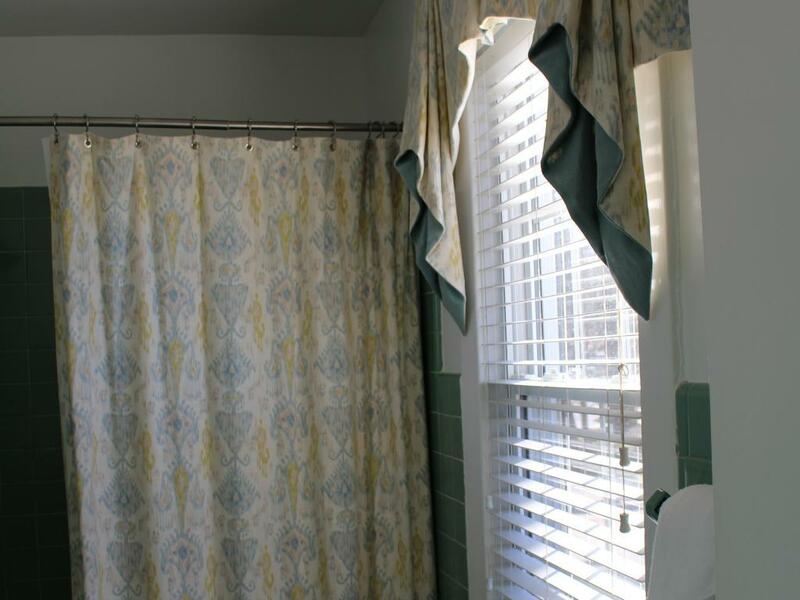 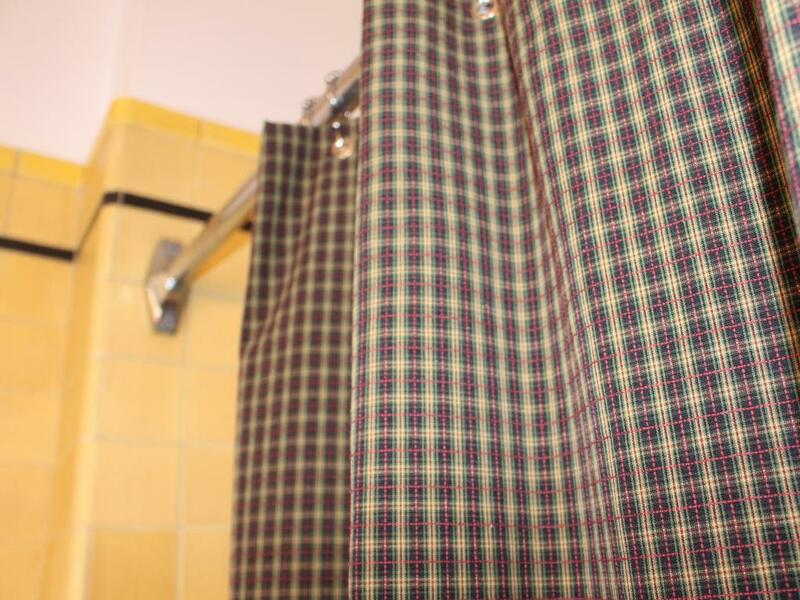 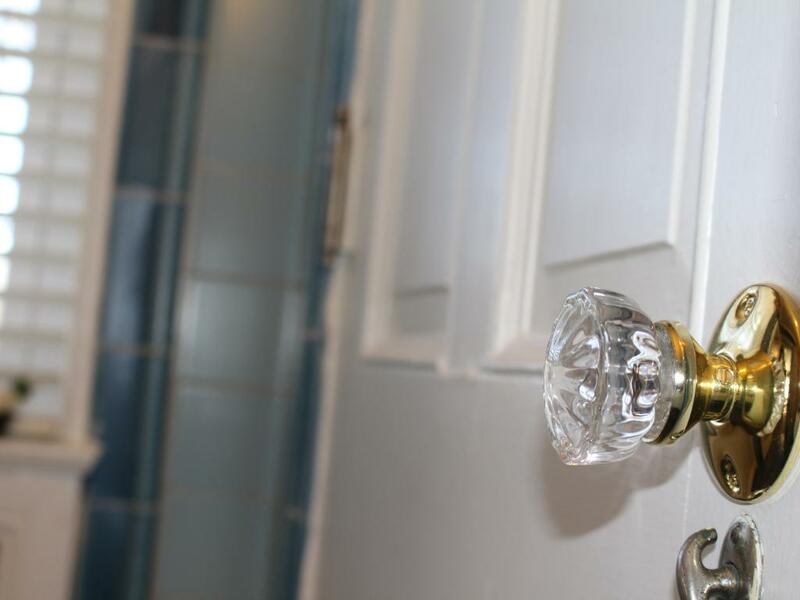 Included with this room is a private full bath with tub and shower complete with original tile and period fixtures. 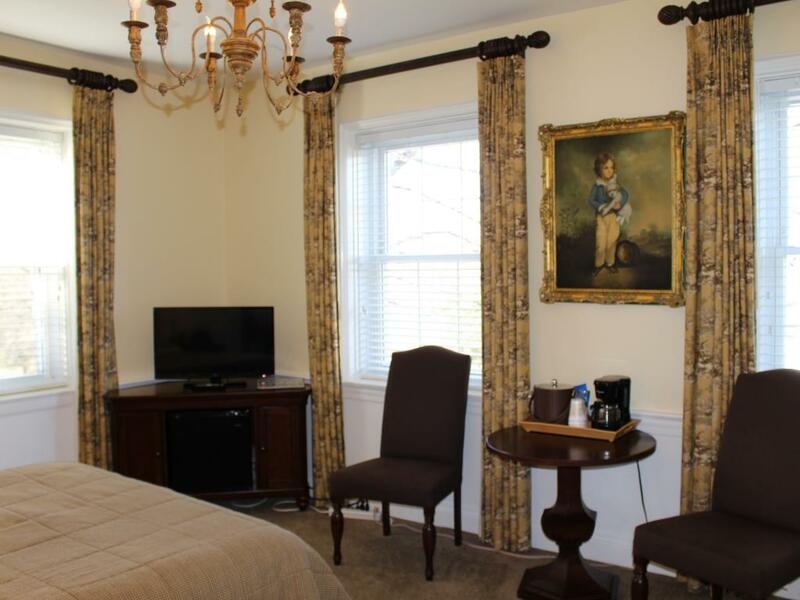 Across the landing hallway from the Walnut Room is a richly appointed room boasting two queen beds and a sitting area featuring a walnut leather settee . 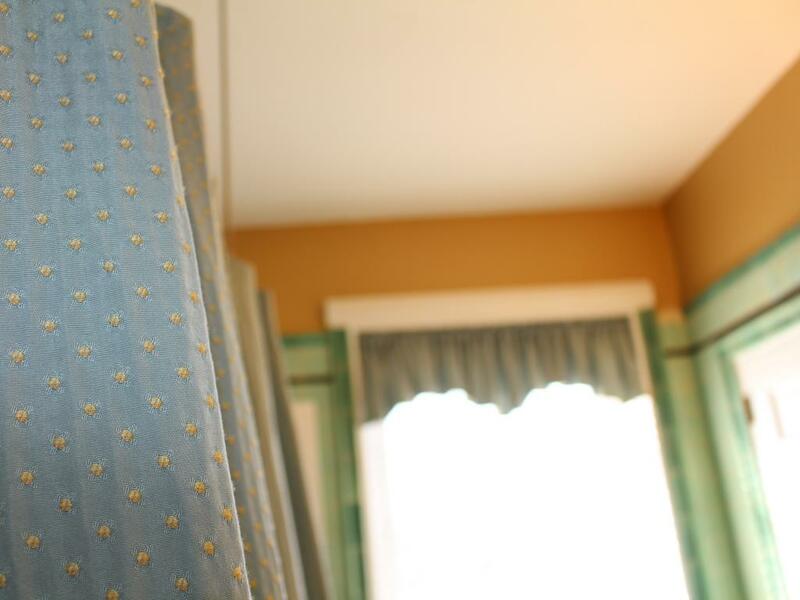 The front window view is of many towering black walnut trees. 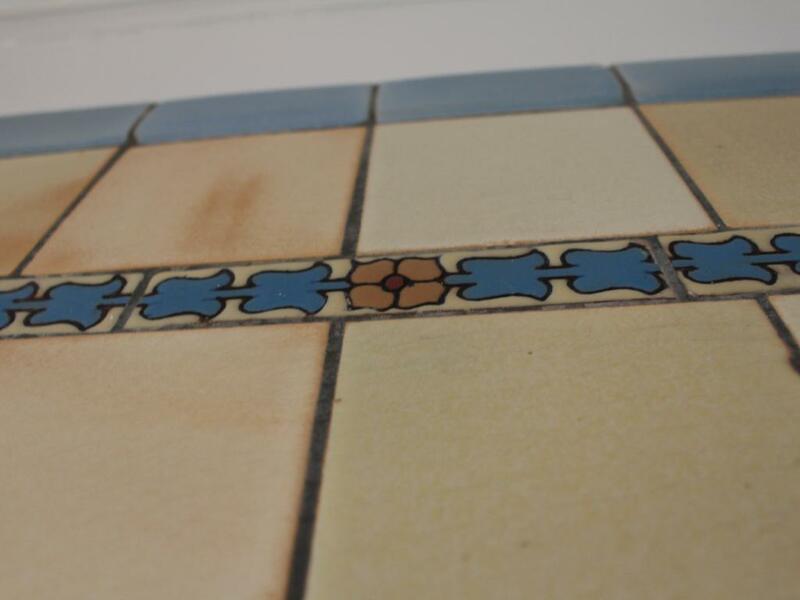 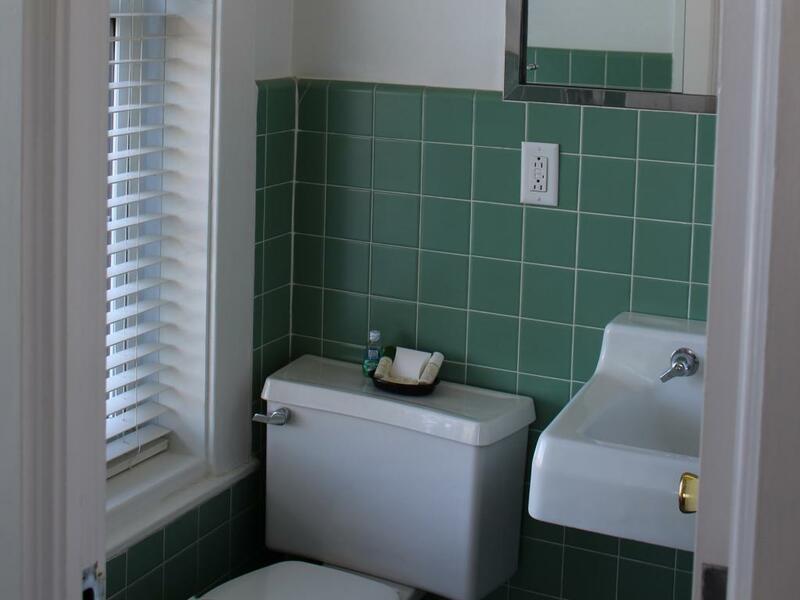 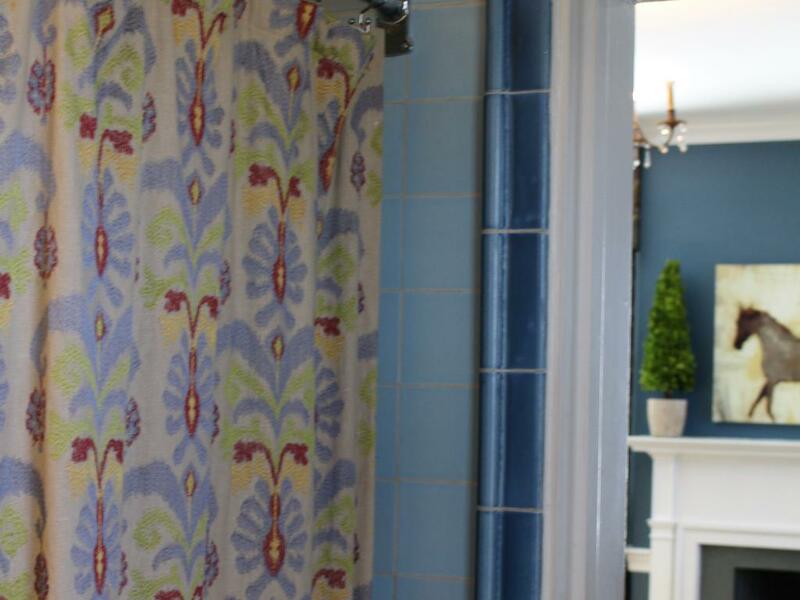 The green tiled large private bath with period fixtures are all original to the house. The historic marker on Manor House Drive describes the Linville history. 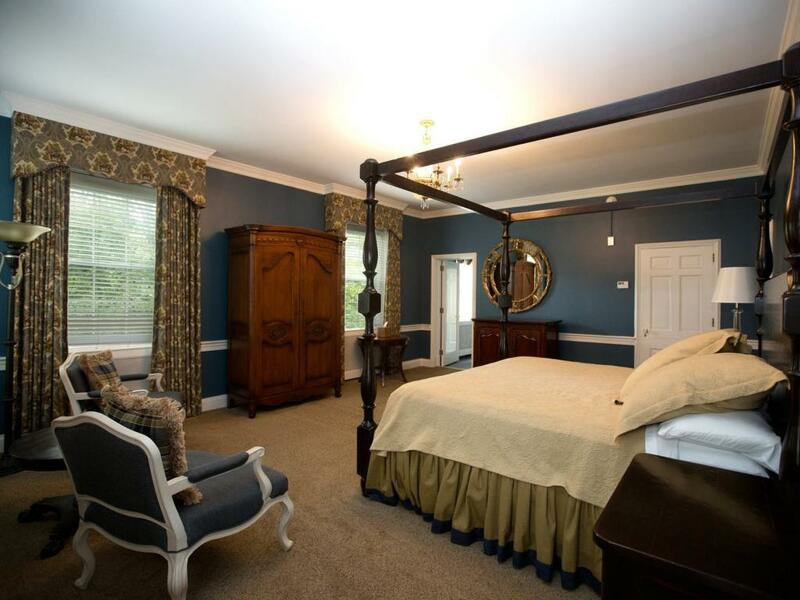 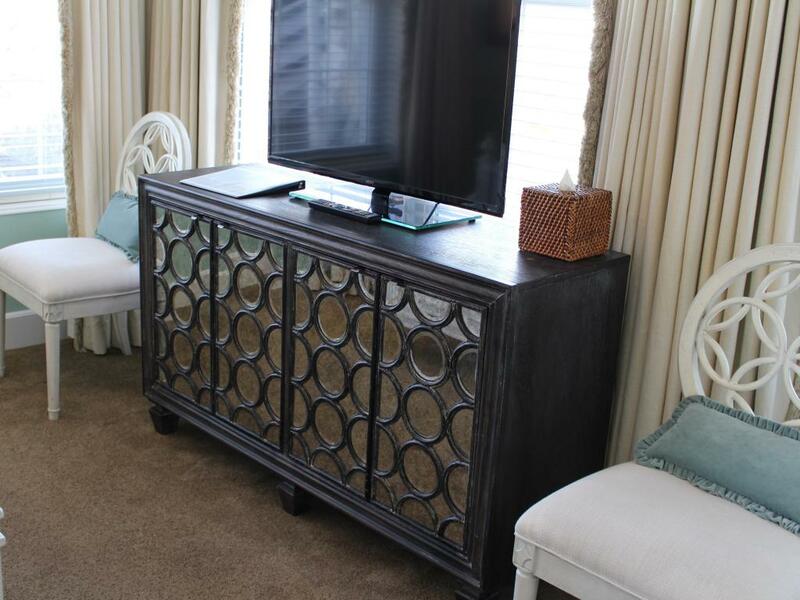 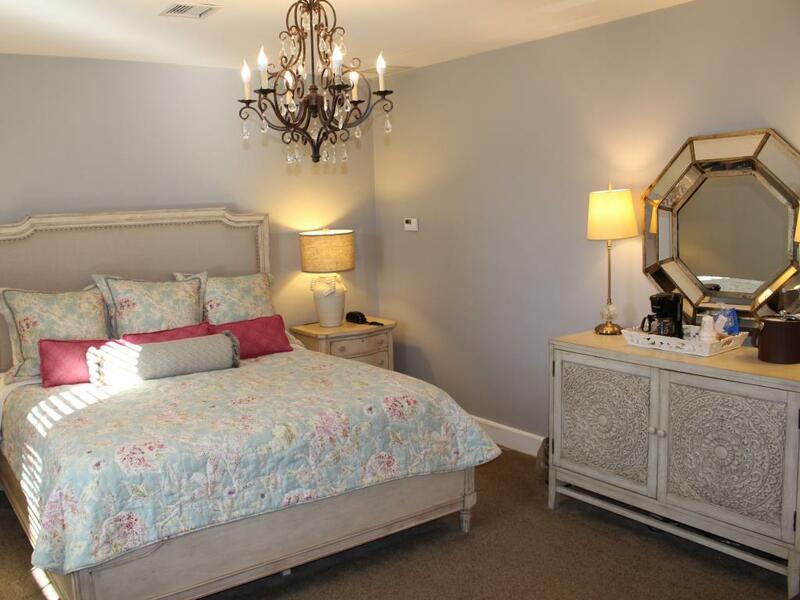 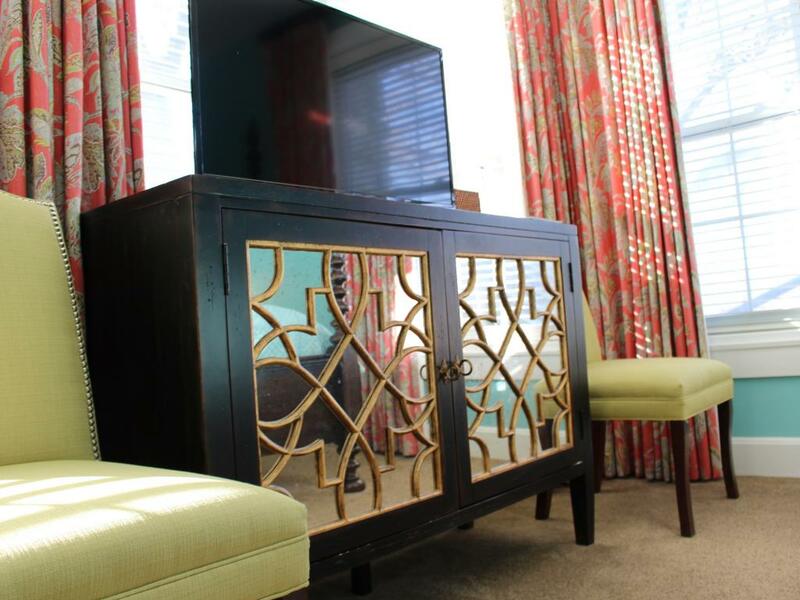 A popular room with a king-size bed and a one step up entrance into a full private bath. 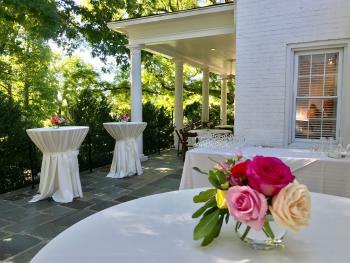 The view overlooks the veranda and the large trees on the expansive front lawn. 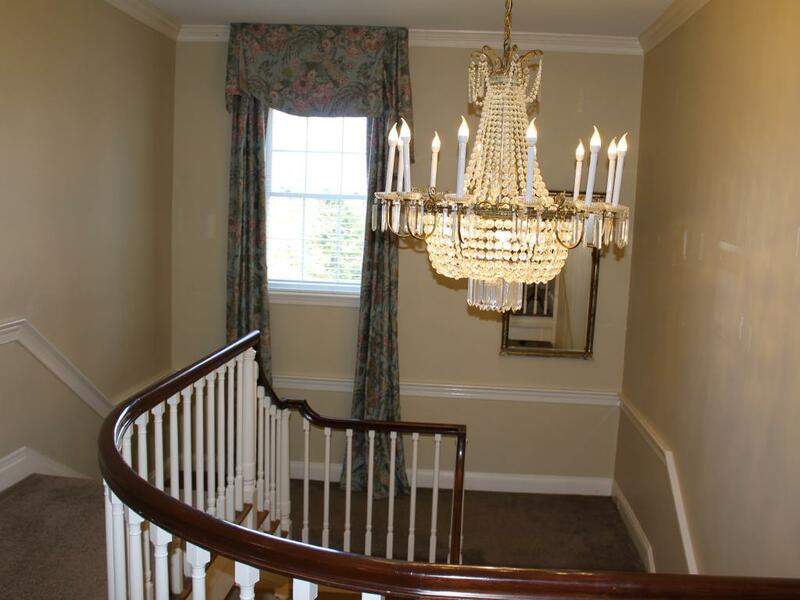 Climb a reversing two-landing staircase which leads to the Walnut Room, located on the North corner of the Manor. 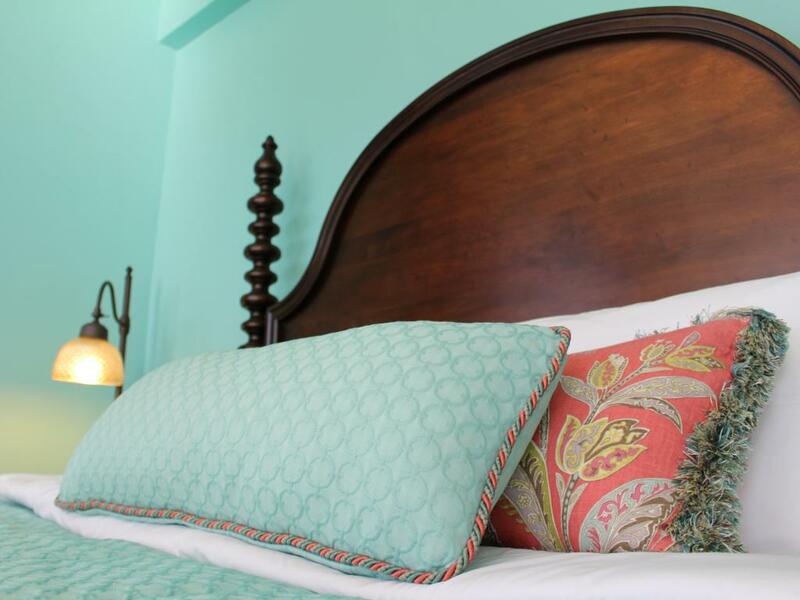 The richness of this red-themed room is enhanced by the custom bedding on the double beds. 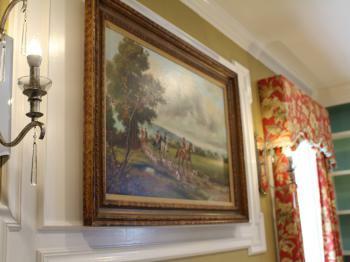 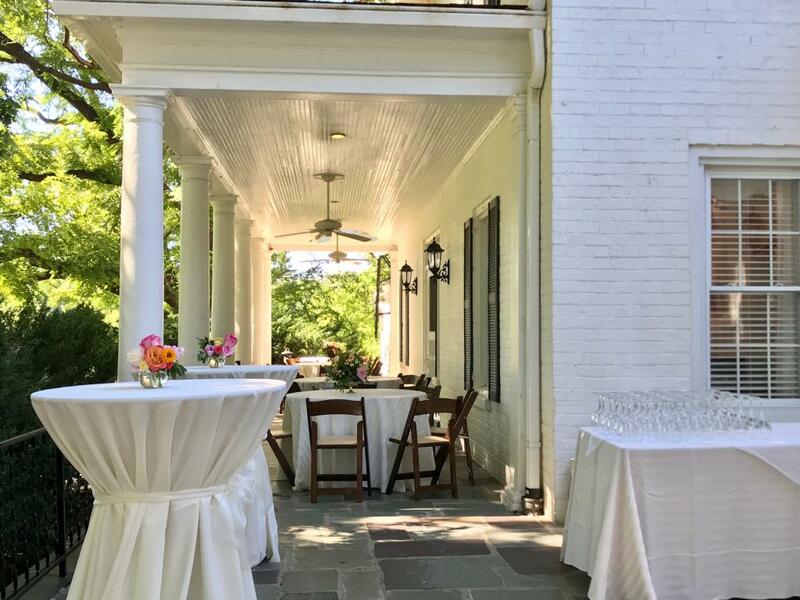 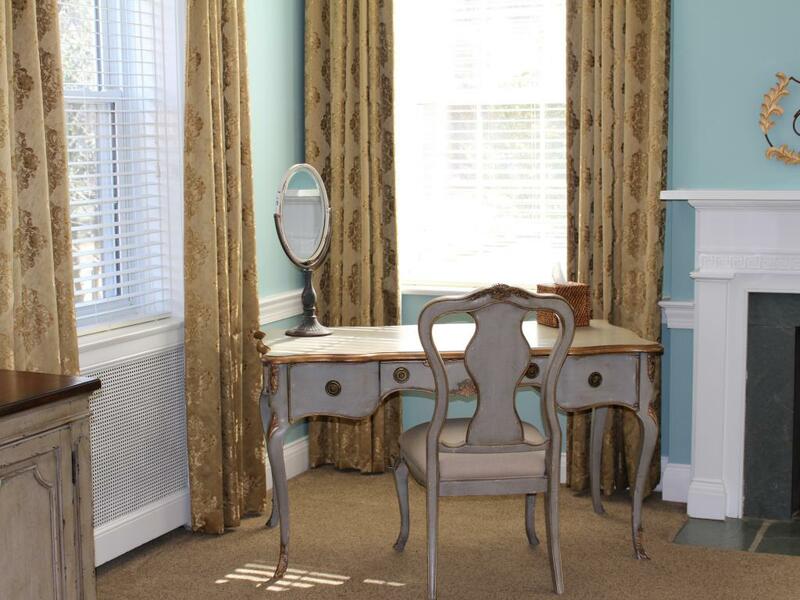 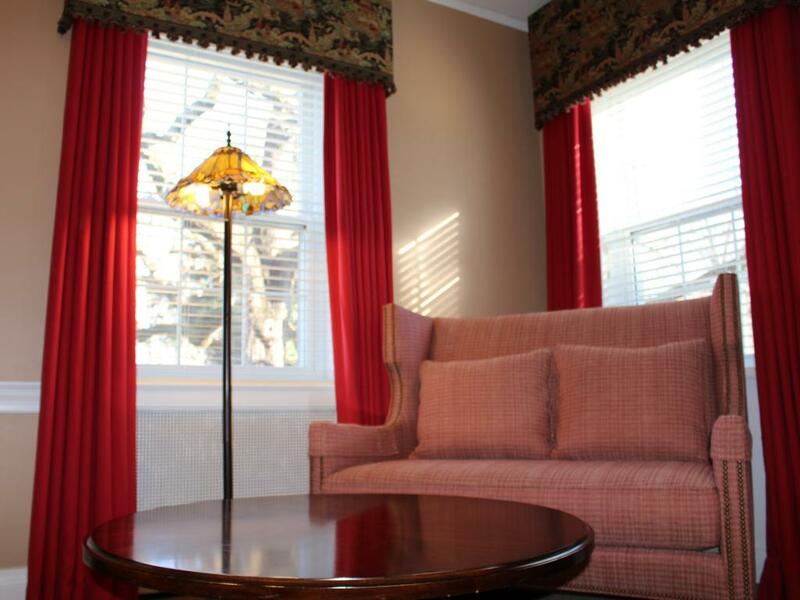 This corner room provides great views of the property Guest House and beautiful Southern Magnolia trees. 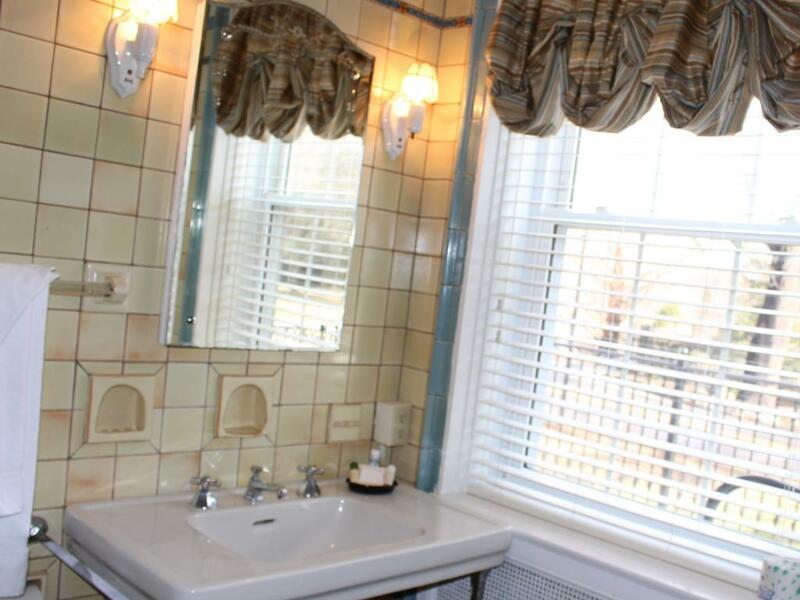 This room features a tiled full private bath with period fixtures. 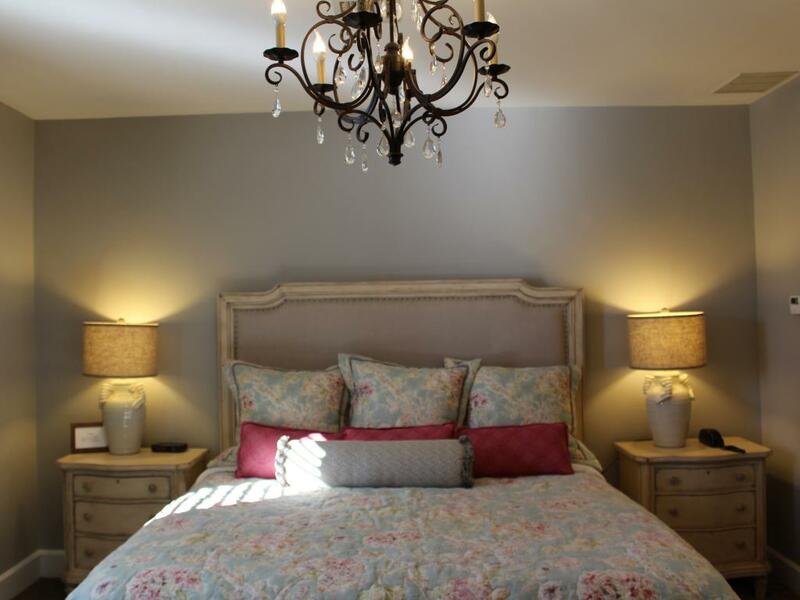 This light-colored room features an entry foyer and is accented in pinks and sage. The Steeplechase Room has two queen poster beds. 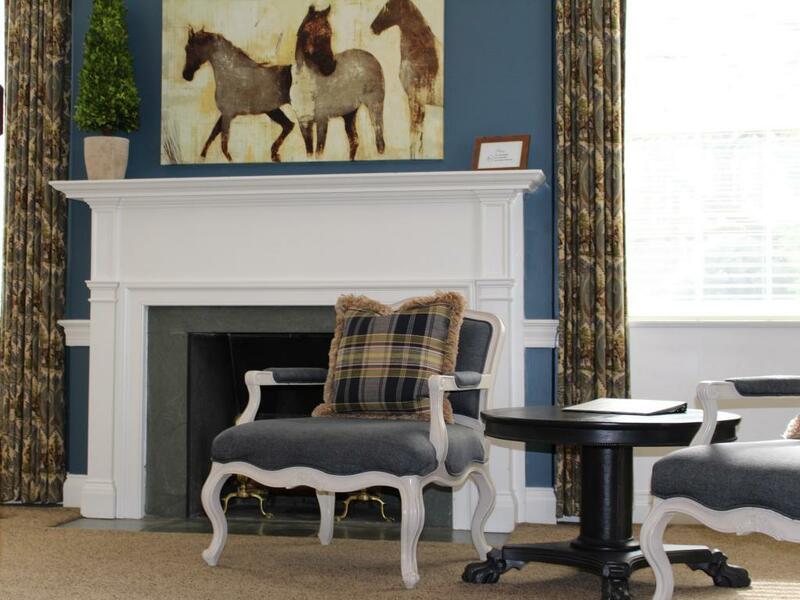 A unique feature in this room is the cozy club chair and ottoman. 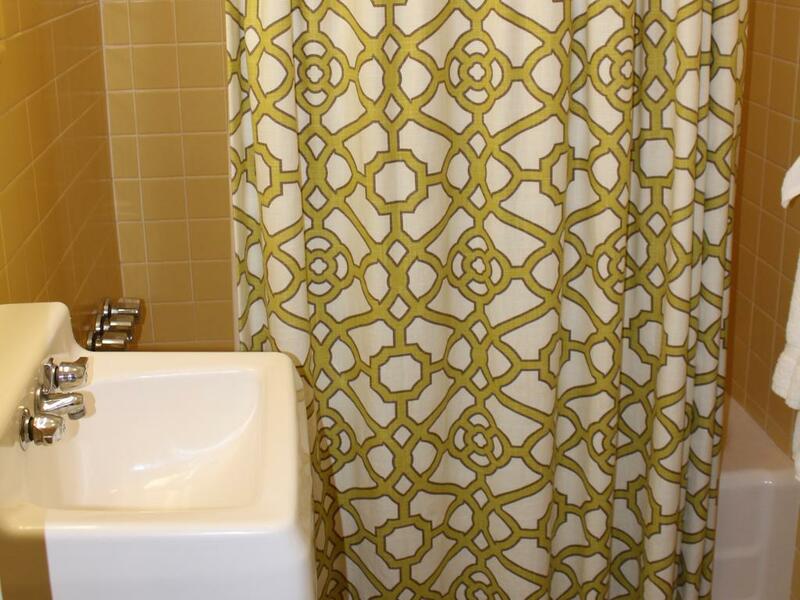 A tiled full updated bath completes this room. A guest favorite. 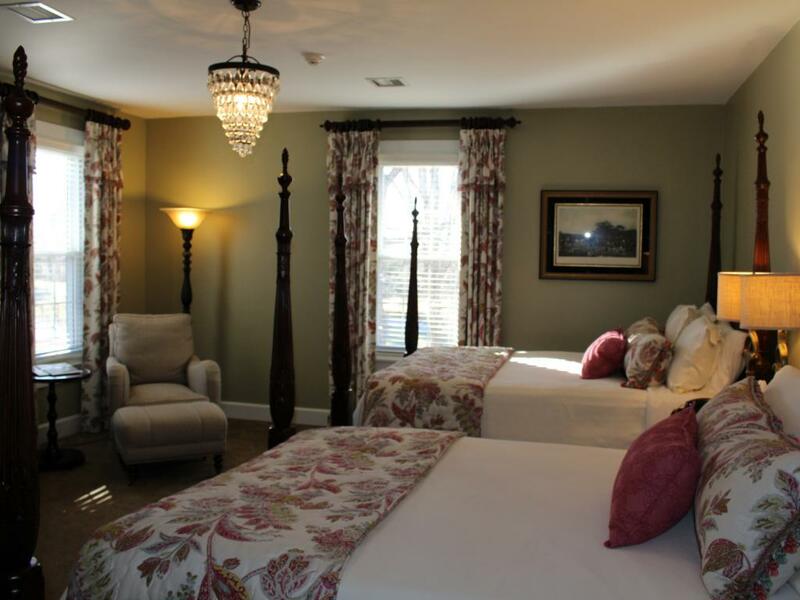 This corner room is flooded with natural light coming from the five windows that encompass the room. This gives you an excellent view of the front lawn and distant pastures. 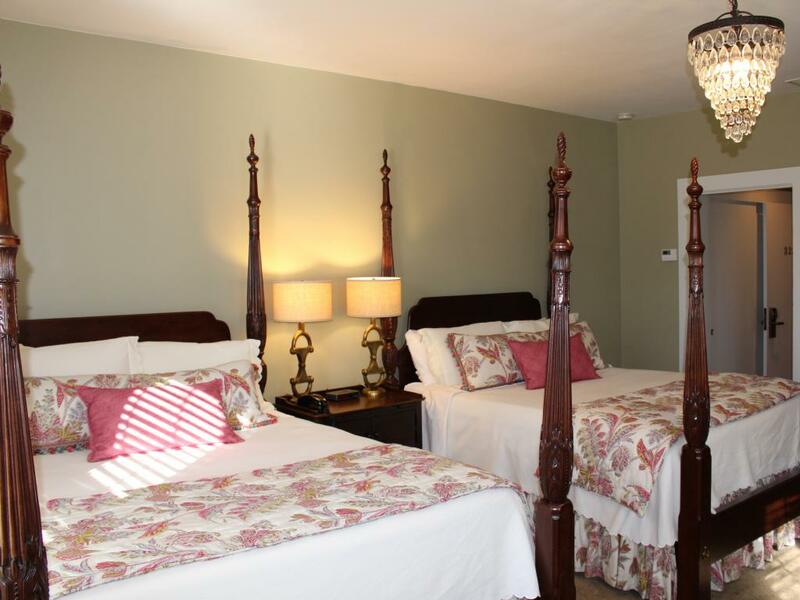 This room includes a queen size bed and a full private bath with a tiled shower. 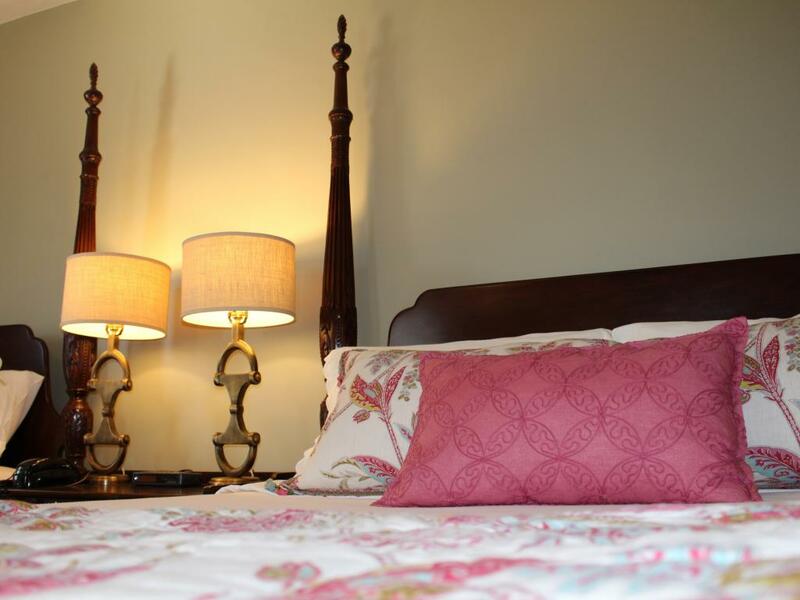 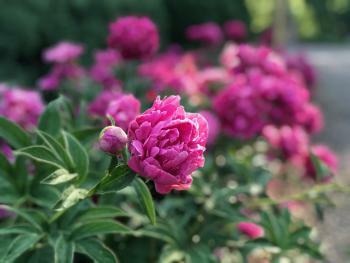 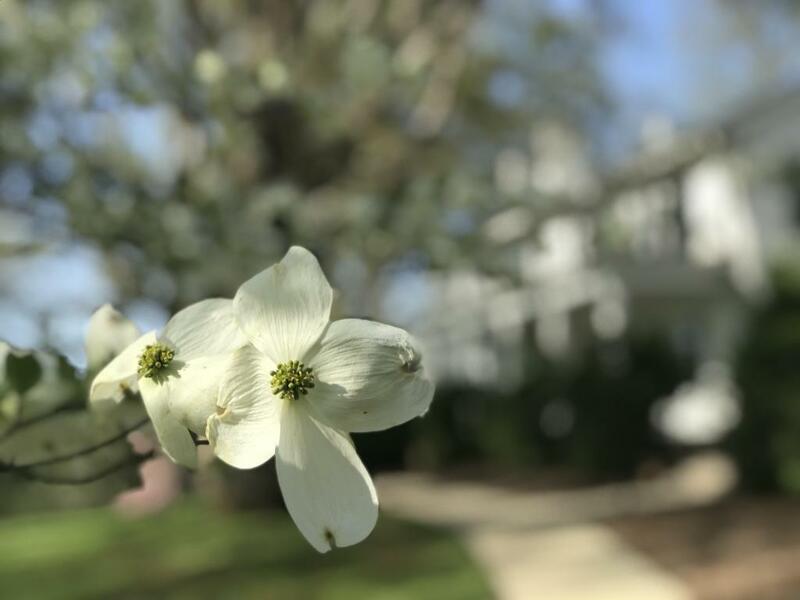 Located in beautiful Tanglewood Park, the Manor House Bed and Breakfast is restored to reflect the gentility of the Victorian era. 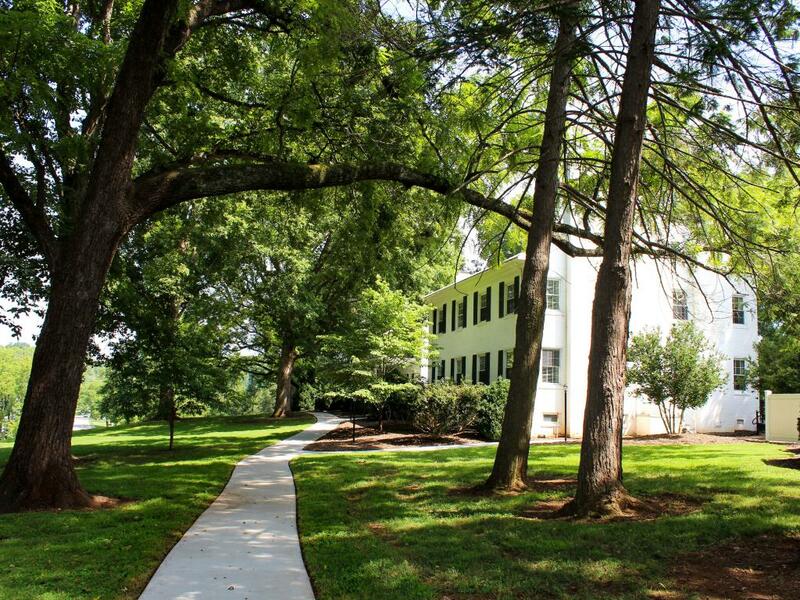 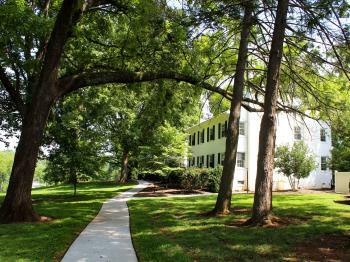 The William Johnson family constructed one section of the house in 1859, and when tobacco magnate William Neal Reynolds and his wife Kate bought the tract of land in 1921 to be their country estate, they added the remainder. 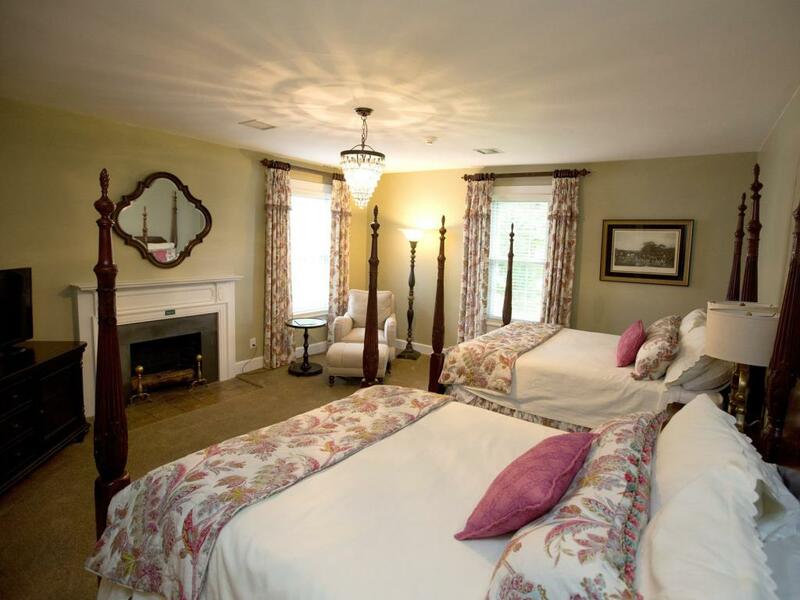 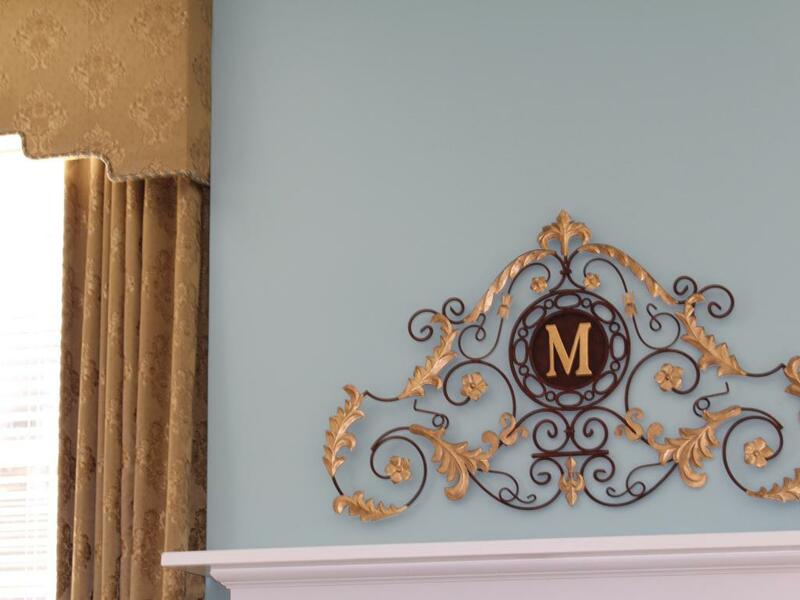 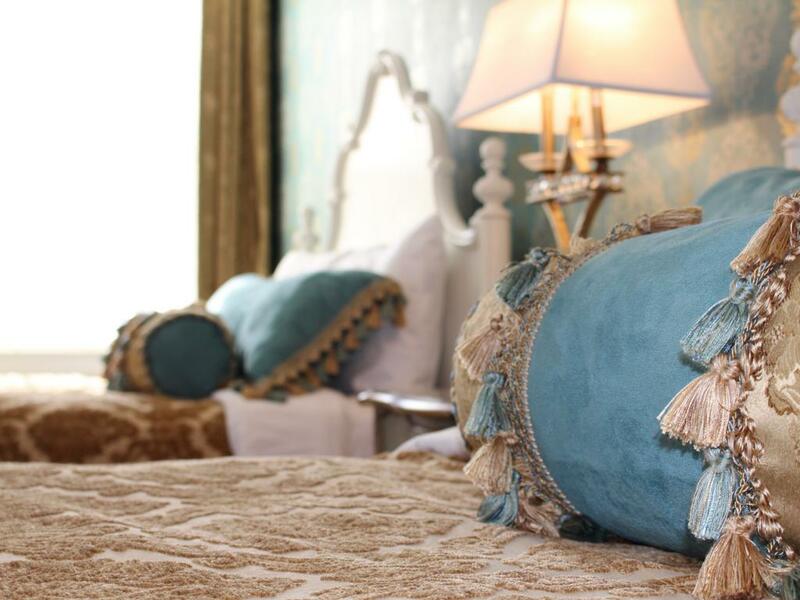 Today guests can enjoy a mix of genuine antique and reproduction furnishings throughout the Manor House, including original staircases, crystal chandeliers, and ten bedrooms with unique charm. 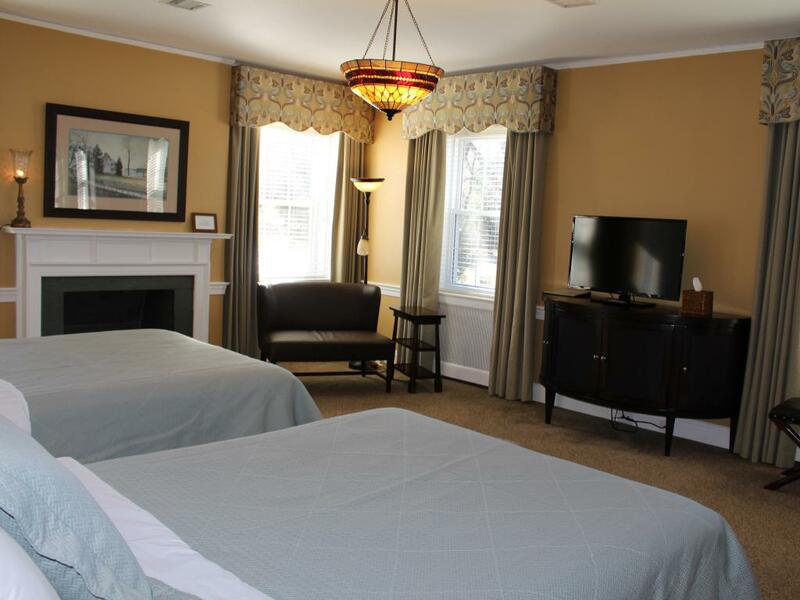 All rooms have private en suite baths, cable-ready television, telephones, clock radios, coffee makers and mini-refrigerators stocked with bottled water. 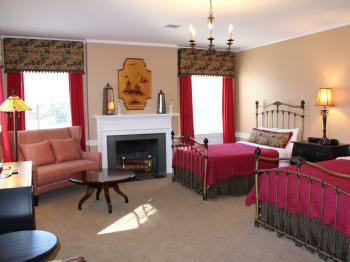 Breakfast is served to guests in the cozy rock fireplace room overlooking the expansive veranda and beautiful grounds. 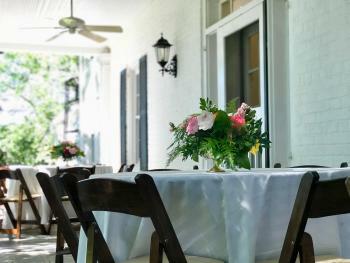 Our chef expertly prepares a fresh, seasonal breakfast for guests each morning. 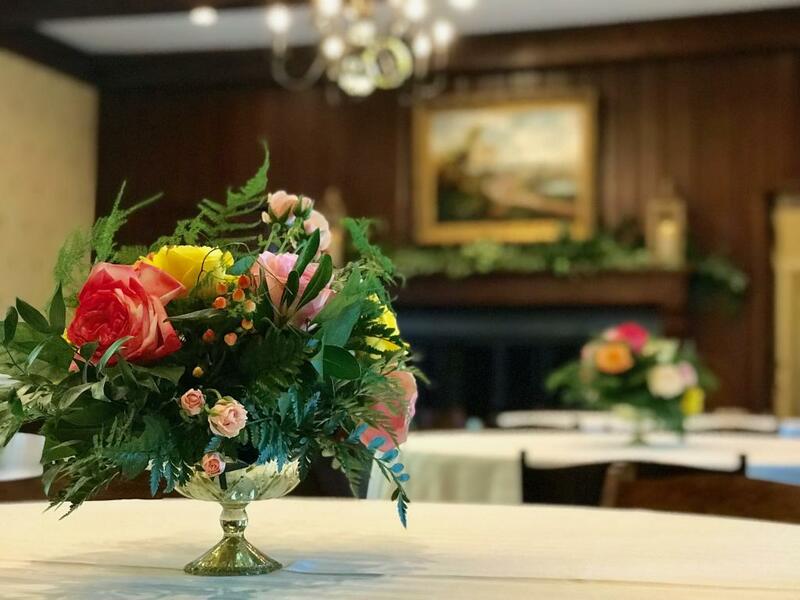 Fresh eggs, bacon, sausage, toast, fresh fruit, scones, muffins, coffee and juice frequently make shining appearances in Chef's delicious breakfast creations. 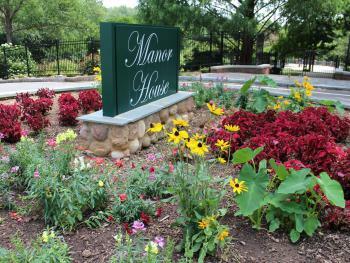 The Manor House is also a magical place for your wedding, celebration, or family reunion. 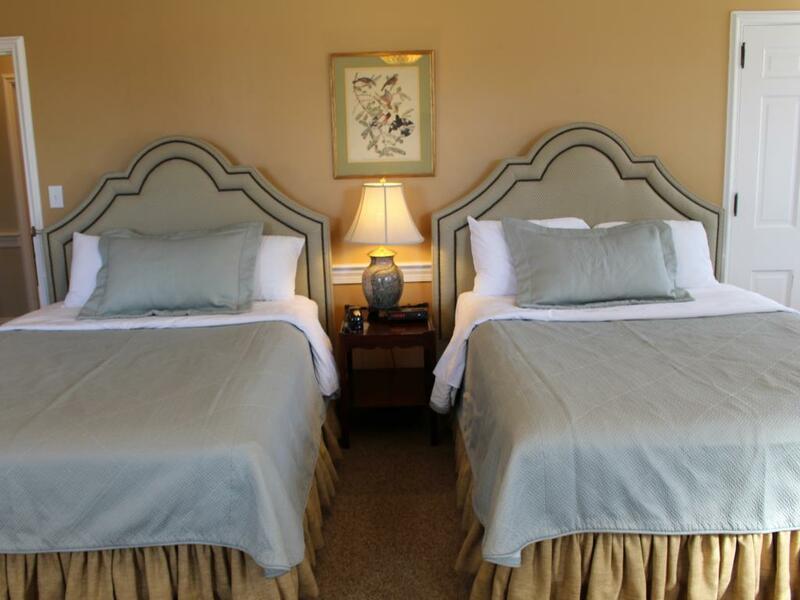 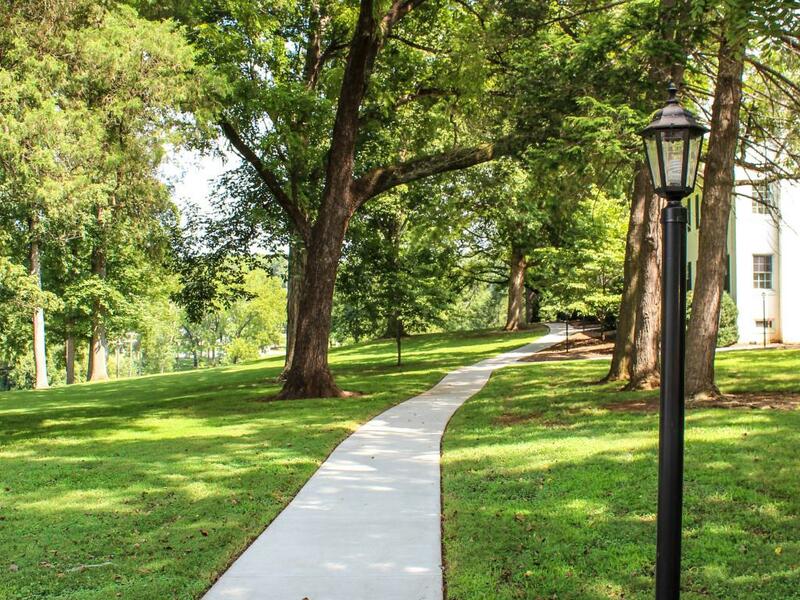 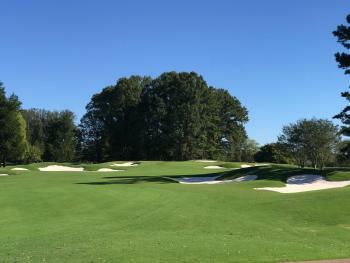 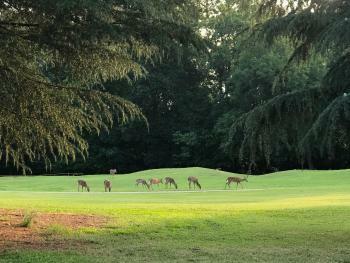 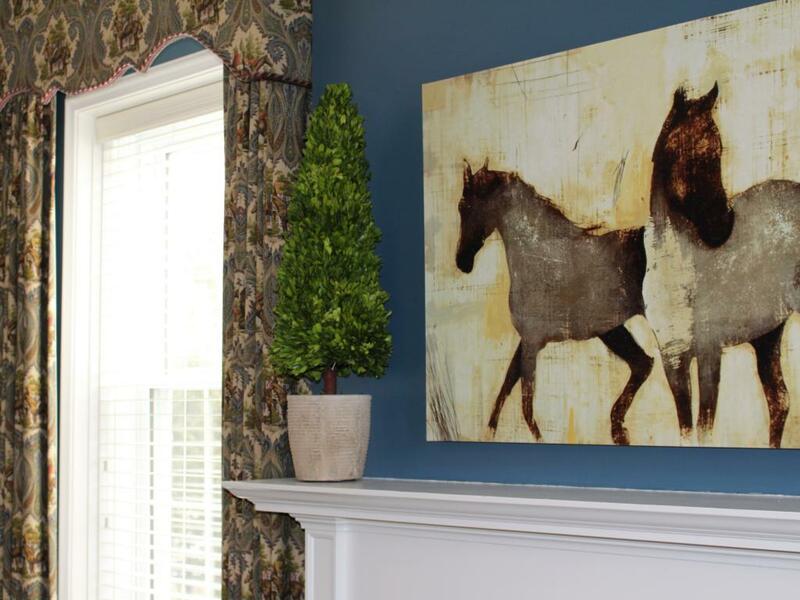 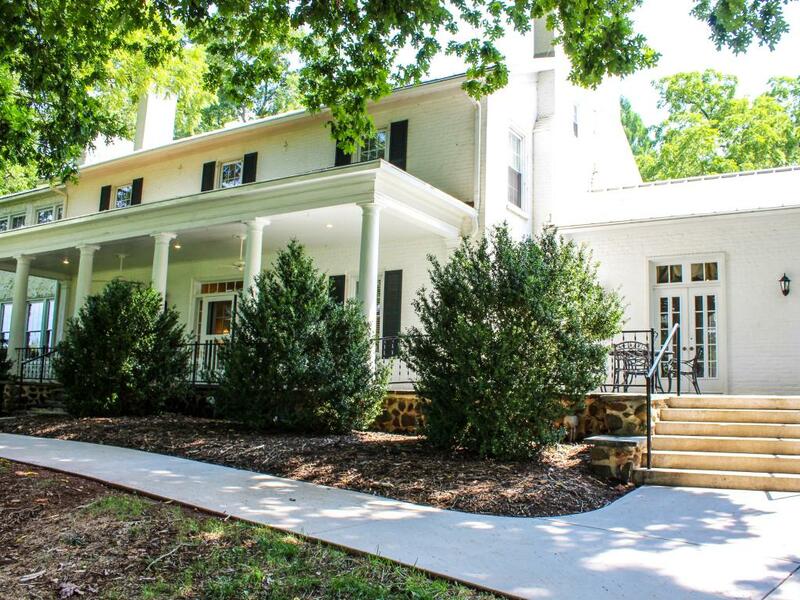 Located in the heart of the 1,100 majestic acre Tanglewood Park, your guests can enjoy two award winning golf courses, the beauty of the arboretum gardens, fishing beside Mallard Lake, playing tennis on 10 lighted courts, horseback riding, running, hiking or biking through the paved and natural trails. For a truly magical holiday experience, be sure to visit during Tanglewood Park's annual Festival of Lights celebration. 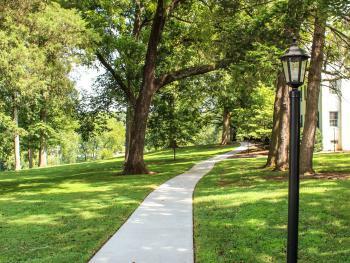 Beginning November through January 1st, Tanglewood Park's rolling countryside will be transformed into a winter wonderland of giant, twinkling snowflakes and whimsical scenes! Entering our 28th season, Tanglewood's Festival of Lights continues to be one of the largest and most spectacular light shows in the entire Southeast.